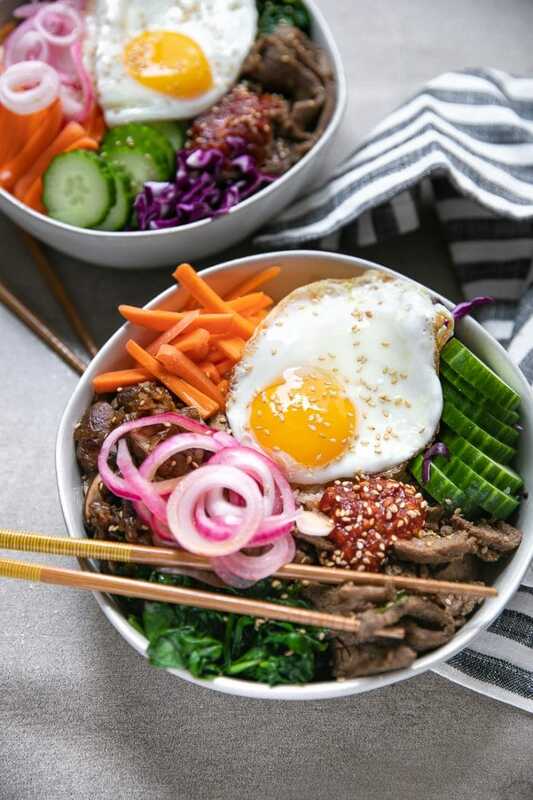 This Easy Korean Beef Bibimbap Recipe is made with warm rice topped with thinly sliced Bulgogi Korean beef, mixed vegetables, kimchi, gochujang (or other sauce), and a fried egg. 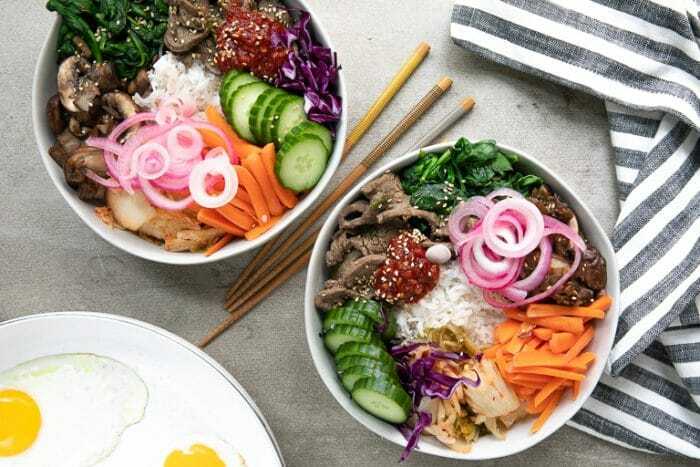 Mix it all together, and the result is a delicious and easy Korean Bibimbap dinner favorite the whole family will love. Translated, the word bibimbap means “mixed rice”. Bibimbap (BEE-bim-bap) is a bowl of warm white rice topped with an assortment of sauteéd and seasoned vegetables, gochujang (or other chili pepper paste), a fried egg, and some kind of sliced meat. From the Joseon Period (1392-16th century) until the 20th century, bibimbap was initially called goldongban, which means rice made by mixing various types of food. This dish, or goldongban, was traditionally eaten on the eve of the lunar new year as a way to use up all the leftover side dishes before the new year. Their solution was to place all the leftovers in a bowl of warm rice and mix them together. More traditional and authentic versions of Bibimbap are served with raw egg and raw beef, but I prefer to eat each of these items cooked. Personal preference. What vegetables go in Bibimbap? 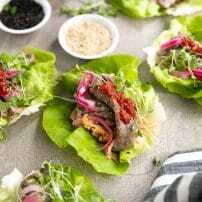 While I have no idea where I would purchase doraji or gosari (my guess is a local Asian supermarket) it is easy to make your very own Korean Beef Bibimbap Recipe with what you have at home. 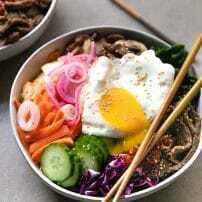 I decided to make this bibimbap recipe a mix of traditional with non-traditional. For example, the addition of kimchi. Kimchi is not something one would typically see tossed in a Bibimbap bowl. However, kimchi is very Korean, so I imagine that kimchi would be, at the very least, served on the side. 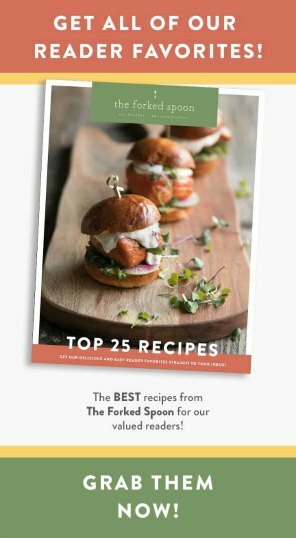 For some of you reading this list, you may be totally unfamiliar with with with several of these ingredients. Don’t worry. I’m going to do my best to break it down for you. 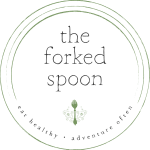 It really is much easier than it appears and any unknown ingredient can be purchased online, so no need to drive a million miles to get something. The key to making any bibimbap recipe is the order in which you actually make the different parts. 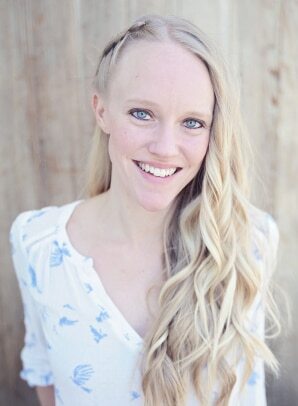 The parts, when taken alone are easy, but all together and at once can get tricky if you don’t know what’s going on. So here’s how I did it. Get your meat situation sorted. In other words. Marinate the beef ahead of time. Korean beef, or bulgogi, really needs some time to marinate. It just comes out tasting better. Ideally, it will marinate overnight. If you don’t have enough time for that, allow for as much time as you can and cook. Make the rice and chop the vegetables. If you’re not using leftover rice (I know I’m not the only one that makes all.the.rice), cook the rice as you chop the vegetables that will not be cooked. In my case, I did not cook the cucumber or the carrots. You will notice that I simply sliced my cucumber- this is fine but I highly recommend that you julienne them- it’s easier to mix. 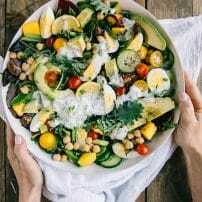 Start preparing the vegetables you plan to cook. In my case, I cooked the spinach first and then the mushrooms. If you are really good at multitasking and don’t mind the additional dirty dishes you can prepare the spinach and the mushrooms at the same time. Otherwise, I suggest cooking the spinach first followed by the mushrooms. Assemble. At this point all the major parts of this bibimbap recipe are complete. The last bit it to start dividing each side between the bowls and start topping with store-bought kimchi, homemade or store-bought pickled red onions, gochujang, and sesame seeds. Don’t forget to add an egg! 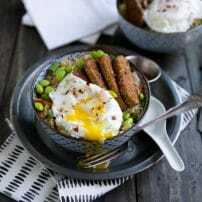 The final step is to fry up one egg for each bibimbap and place directly on top. Stir and mix together. All the many different flavors! And they all go so well together. There’s an egg on top which pretty much gives it an automatic thumbs up. There is something for everyone. In other words, just because I filled my bowl with all the vegetable and meat sides, does not mean you have to. Do you think my 4-year-old ate the kimchi or the spinach? nope. But he loved the rice and egg and beef and mushrooms. You can make most of it ahead of time. And you can make extra which means leftovers or…MEAL PREP! yayyyy! If you try cooking this Easy Korean Beef Bibimbap Recipe, please leave me a comment and let me know! I always love to hear your thoughts. 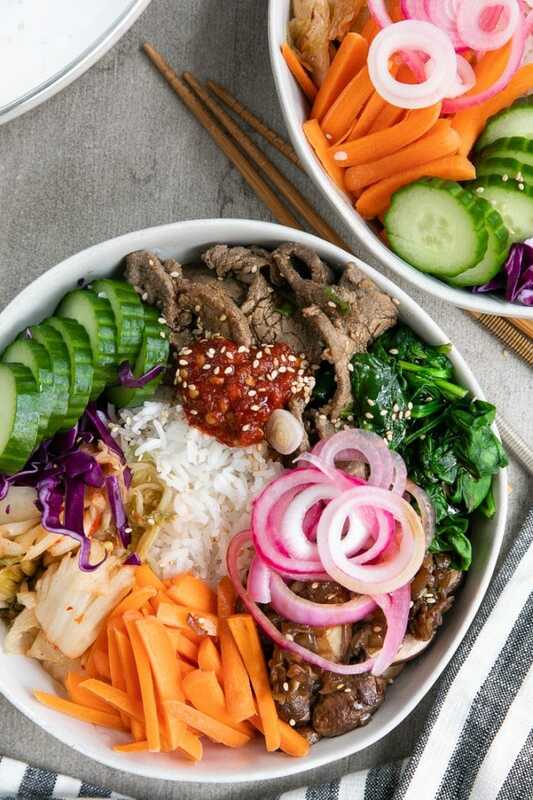 DON’T FORGET TO PIN AND SHARE THIS EASY KOREAN BEEF BIBIMBAP RECIPE TO MAKE FOR A FLAVORFUL AND HEALTHY DINNER THE WHOLE FAMILY WILL LOVE. 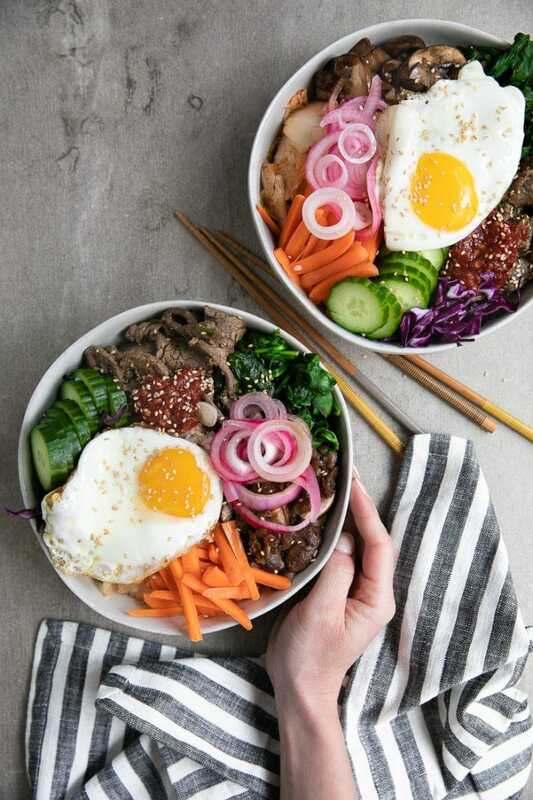 This Easy Korean Beef Bibimbap Recipe is made with warm rice topped with thinly sliced Korean beef, mixed vegetables, kimchi, gochujang (or other sauce), and a fried egg. 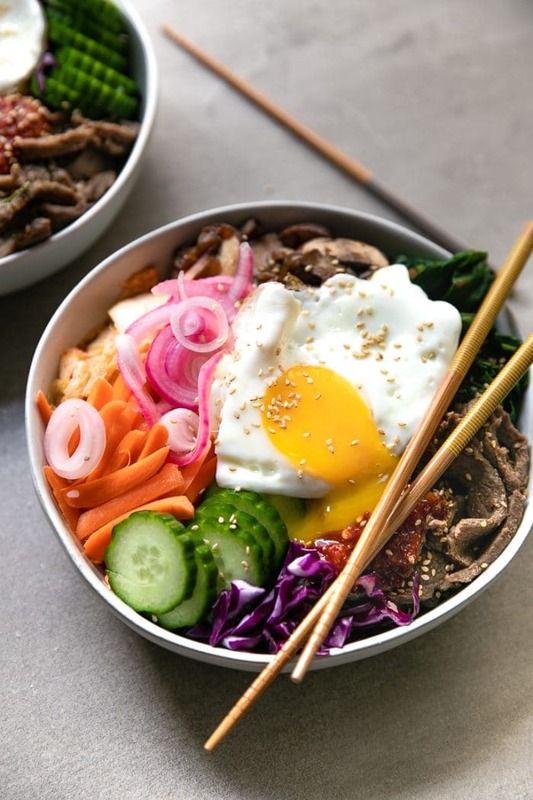 Mix it all together, and the result is a delicious and easy Korean Bibimbap dinner favorite the whole family will love. If rice has not yet been cooked, cook rice according to package instructions. If rice has already been made, divide the rice between the desired number of bowls (this recipe makes approximately 4 generous servings). Gather the vegetables that will not be cooked- kimchi, carrots, cucumber. Prepare those ingredients first and divide between the bowls, arranging around the outer perimeter of the bowl. Heat one teaspoon of olive oil in a large skillet over medium heat. Working in batches if necessary, add the spinach to the skillet and cook until all the spinach is cooked and wilted. Add half of the minced garlic to the skillet and sauté for one minute, or until the garlic is fragrant. Add half (1 tbsp) of the soy sauce to the spinach and cook for an additional minute. Remove the spinach from the skillet, dividing among the Bibimbap bowls. Using the same skillet, heat one more teaspoon of olive oil over medium heat. Add the remaining garlic and sauté, stirring constantly, for one minute, or until garlic is fragrant. Add the mushrooms to the skillet and cook, stirring often until mushrooms start to drop some of their liquid. Add the remaining one tablespoon of soy sauce and mix well. Cook for an additional 1-2 minutes. Remove the mushrooms from the skillet, diving among the Bibimbap bowls. Add the final teaspoon of olive oil to a clean non-stick skillet over medium heat. Fry the eggs on one side until yolks are runny but whites are firm, approximately 2 to 4 minutes each. As the eggs are cooking top each bowl with cooked Korean beef, pickled red onions, sesame seeds, and a scoop of gochujang (Korean hot pepper paste). Carefully transfer one egg to each bowl and serve immediately. Enjoy! Marinate your meat for at least 30 minutes to overnight! For a lighter meal, swap out the rice and make cauliflower rice instead.